Are you tired of exorbitant green fees, bad tee times, and country club snobbiness, then why not try Disc Golf. Disc golf is much like traditional "ball golf" except you use a flying disc or Frisbee instead of a ball. You launch the golf disc from the tee area towards a target which is the 'hole'. The hole is usually what is called a Pole Hole consisting of an elevated metal basket on a pole. The object, like traditional golf, is to complete the hole in the fewest number of throws as possible. Serious players carry a number of discs with them - long range, medium range, specialty, and putt-approach discs that are used depending on the type of throw required (teeing off, short putt, long putt). Where can you play Disc Golf? 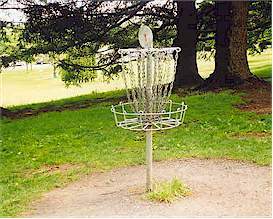 You can make up your own course using garbage cans, or fixed objects like trees if you want, but why not try one of three courses listed below that were specially designed for Disc Golf. All courses are FREE. 1. The Little Mountain Disc Golf Course at the southeast corner of Queen Elizabeth Park (located at 37th and Ontario Street) in Vancouver. Eighteen tees (12 tees are less 300 feet, 6 tees are 300 to 400 feet) at 9 baskets with a total course distance of 4794 feet. 2. Mundy Park in Coquitlam (2300 Como Lake Avenue, near the ponds on the west side of the park) 9 hole course with a total distance of 1797 feet. 3. Winskill Park in Tsawwassenn ( 5575-9th Ave., South Delta - 1 mile from U.S. border at Pt. Roberts); 9 holes (8 holes are less than 300 feet, 1 hole is 300 to 400 feet) with a course distance of 1784 feet. Update 2016: Two more course have sprung up in the Greater Vancouver area: A 9-hole, 2430 feet course located at Robert Burnaby Park in Burnaby (follow Canada Way to 16th Avenue, turn northeast and then left on 1st Street), a 9-hole, 2300 feet course on the old Jericho School lands (located on the hillside of the Jericho Hill Community Centre at 4196 W. 4th Ave., Vancouver), and at Quilchena Park (4590 Magnolia St.).